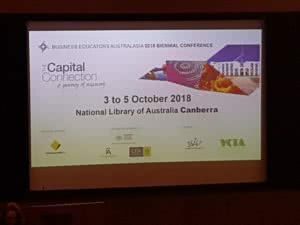 IAA was proud to attend the 2018 Business Educators Australasia (BEA) Conference in October. This year the conference was held in Canberra with the fitting title ‘The Capital Connection: a journey of discovery.’ Some of the themes of the conference included financial literacy, accounting and business management, accounting education, business, economics and legal studies within Australian secondary schools. The conference featured over 30 presentations and workshops, which gave educators the opportunity to update and share their skills and knowledge in business education. BEA is the peak organisation for 11 subject associations that support the teaching of economics and business education. In conjunction with its affiliated associations, it aims to promote and extend economics and business education.